The player, who has built the most Temples at the end of the game, wins. In case of a tie, the number of Towers built counts. If this does not resolve the tie, then the player who is ahead in the building of Huts wins. If, before the game end, a player succeeds in building all buildings from two out of the three different types (Temples, Towers and Huts) then he immediately wins the game. A player who squanders his building pieces and is unable to build anymore is immediately eliminated from the game. The youngest players starts the game. Players take their turn in clockwise order. 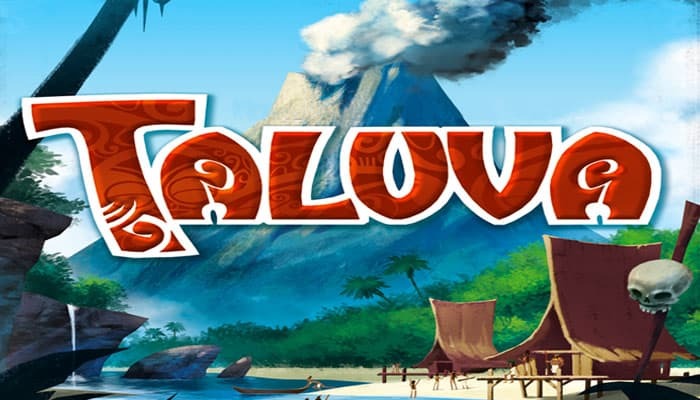 The player draws one Volcano tile from the stack and takes a look at it. In the first turn of the game, the player simply puts the tile in the middle of the table. 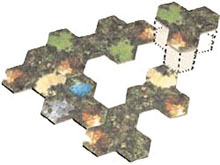 The player places the tile directly on the table. At least one side of the tile should touch one or more tiles that are already on the table. This may result in "gaps" in the landscape. The player places the tile on top of existing tiles. The Volcano field should be placed on an existing Volcano field. The Volcano may not have the same direction as the Volcano that is being covered. No free spaces may be left under the tile. It is allowed to cover both your own and other player's Huts. This can result in Settlements being split in two. Covered huts are returned to the box. It is allowed to cover two or three Volcanoes. It is not allowed to cover Towers or Temples. It is not allowed to cover a Settlement completely (i.e. at least one building piece of a covered Settlement should remain). Building pieces may only be placed on empty fields. You cannot build on a Volcano. It is allowed to connect two of your own Settlements to each other. If a player cannot build, he is eliminated from the game..
"Building a Hut" is the only way to start a new Settlement. The player places one Hut on a level 1 field of his choice. The player places one Tower on a level 3 or higher field, that is adjacent to one of his own Settlements. No Tower may yet be present in this Settlement. The player places one Temple on a field on any level, that is adjacent to one of his own Settlements. The Settlement must have a size of at least three fields, and no Temple may yet be present in this Settlement. 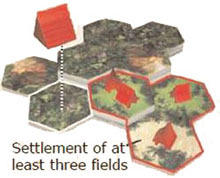 "Expand an existing Settlement" is the only way to place more than one Hut in one turn. The player chooses one of his Settlements to expand. After that, he chooses one type of terrain (Jungle, Clearance, Sand, Rock or Lake) on which he would like to build. Now, he occupies every field of that terrain type that is adjacent to the Settlement. For each level of the field, one hut is placed: on a level 1 field one Hut, on a level 2 field two Huts, etc. 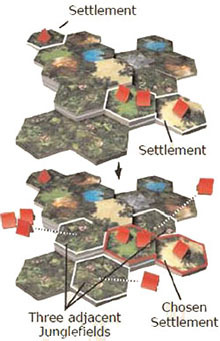 Example to the right: The player would like to expand his below right Settlement. As terrain type, he chooses "Jungle". 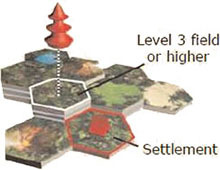 There are three Junglefields adjacent to the Settlement: in his turn, the player places one Hut each on the two level 1 fields and three Huts on the level 3 field. He may not build on the Junglefield in the front left as that is not adjacent to the Settlement. From the possibilities mentioned above, a player may only choose one for which he still has enough building pieces (Temples, Towers or Huts) in his pool, and all the conditions are met before building (so, after building there may be for example two Temples in a Settlement). 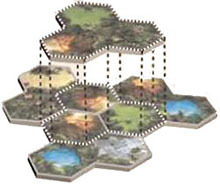 If a player cannot build: A player must place at least one building piece per turn. If he cannot do this, he is eliminated from the game and has lost. During the remainder of the game, his turn is skipped. The building pieces he has already placed remain on the landscape. If no more Volcano tiles can be placed because they have all been used, the game ends immediately. The player who has built the most Temples wins the game. If there is a tie, the most Towers counts as well. It there is still a tie, then the number of Huts built also counts. This includes any Huts that have been returned to the box. Eliminated players are not considered during counting. If a player has placed all building pieces of two of the three types, he immediately wins the game. If a player manages to completely build two building types, the game does not end. The player gets the first place, and the others continue play without him. If another player manages to finish before game end, he gets second place, etc. The first player who is eliminated because he cannot build anymore finishes last. If another player is eliminated he ends one-before-last, etc. 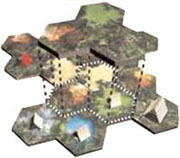 If no more Volcano tiles can be placed, the remaining places are divided among the remaining players based on the number of Towers, Temples and Huts built, like with a regular game end.